Homeowners spend a lot of money on home entertainment systems. Without proper lighting, this investment may not be maximized. What is the best way to light a family and entertainment room with 19-foot ceilings? The room has large exposed beams and trusses on about 15-foot centers, the bottom of which are at 9 feet above the floor. You can easily install lighting above the beams or within the trusses to direct the light toward the ceiling. This indirect lighting effect can be achieved with either low-voltage linear strips or new LED strips. These can be mounted on the beams and trusses so they are not visible from below, and the effect is very effective for creating a soft, comfortable level of light. Dimming this type of light is essential and provides great flexibility. Also useful and attractive would be small, inconspicuous track lighting at the bottom of the beams and trusses. Don’t assume that all the light in a tall space must come from the ceiling. The addition of a variety of table and floor lamps will provide good task lighting and a sense of human scale that will balance the ceiling height. One more method of lighting such a tall space is the addition of wall sconces, provided there are appropriate mounting surfaces. To get answers to all your home lighting questions, contact a Hortons showroom. After creating a space with the appropriate layers of light, bring it all together to create the most entertaining and enjoyable atmosphere with an integrated dimming system. Having an integrated dimming system is key to successful layering. Imagine being in a movie theater and having all the lights abruptly turn on at the end of the film. The experience would be diminished, just as it would be if the same happened in a home entertainment room. 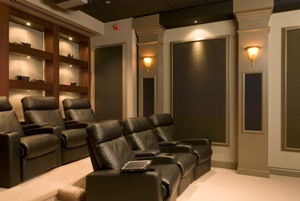 A dimming control system allows a person to control the lighting in order to create a genuine movie theater experience. Integrated dimming systems have become very affordable, and are available through most ALA-member lighting showrooms. Visit a Hortons showroom for tips on installing the best dimming system for your home. An entertainment room can serve as a place to watch movies and sports, play video games or just hang out with the family. To make one room flexible enough for different activities, think in layers of light. The objective of using layers is to create lighting options for multiple tasks and activities in the same space. A lighting layer is defined as a specific type of fixture that is unique from others in the same area. For example, a room with recessed downlights, a decorative fixture in the center of the room, and wall sconces on one wall is defined as having three layers of light. Each of the three types of fixtures would be controlled by separate switches. If the idea of combining several different types of light sounds complicated, just ask a lighting professional at an ALA-member lighting showroom for help. The process can be very simple and inexpensive with advance planning and some guidance. For help with selecting and installing the best light fixtures to create the perfect entertainment space, visit a Hortons showroom.